At Decatur Medi Clinic, we provide care for all ages, from newborn to geriatric, for a wide variety of medical needs, including preventive care, immunizations, care of acute illnesses, and urgent care needs. We also perform sports physicals, work physicals, and DOT exams. We offer a wide range of diagnostic services such as laboratory evaluation, X-rays, and EKG. 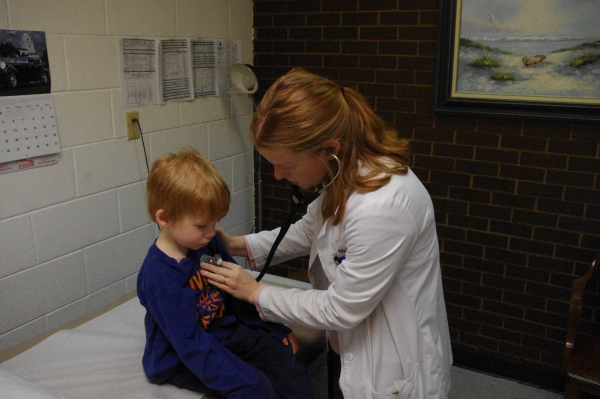 We accept most insurance plans, including Arkansas Medicaid, ARKids, Missouri Medicaid, OK Medicaid, and Medicare. Please contact us with any concerns; we are willing to work with any financial situation. It is our pleasure to meet your medical needs. The goal of preventive medicine is to prevent disease or injury at the earliest possible stage through screening, education, medications, and/or lifestyle changes. Ages 0-18 : We perform routine physical exams at 2 weeks, 1 month, 2 months, 4 months, 6 months, 9 months, 12 months, 18 months, and 2 years. Thereafter we perform annual physical exams until the age of 18. These are referred to as EPSDTs, for Early, Periodic Screening Diagnostic and Testing. With these annual evaluations we also perform Head Start physicals, kindergarten physicals, sports physicals, and camp physicals. At these evaluations we assess for and administer the appropriate immunizations for free to those eligible through the Vaccines for Children Program. We also provide long-term care and/or referral to specialists for chronic medical conditions. Ages 18-40 : We perform routine physical exams as indicated by health status and work environment. We perform work physicals and DOT exams. We recommend Well Woman Exams, including pap smears and breast exams. We have a wide range of diagnostic tools for preventive medicine and care for a full spectrum of chronic medical problems such as asthma, allergies, eczema, depression/anxiety and type 1 and type 2 diabetes. Ages 40-65 : We perform recommended annual physical exams with screening for preventable diseases, as well as work physicals and DOT exams. We also care for chronic medical conditions such as high blood pressure, emphysema/COPD, thyroid problems, high cholesterol, and diabetes. Ages 65+ : We perform annual physical exams and screening, including free Welcome to Medicare Exams, work physicals, and DOT exams. We also care for chronic medical conditions, including high blood pressure, high cholesterol, emphysema/COPD, osteoperosis, incontinence, arthritis and sleep disorders. Utilizing our clinic for urgent situations helps reduce medical costs, time spent in ER waiting rooms, and ER volume, leading to better medical care for all. We perform pre-employment physicals, TB tests, adoption physicals, work physicals, and DOT physicals. We also provide Worker's Compensation evaluations for several local companies.